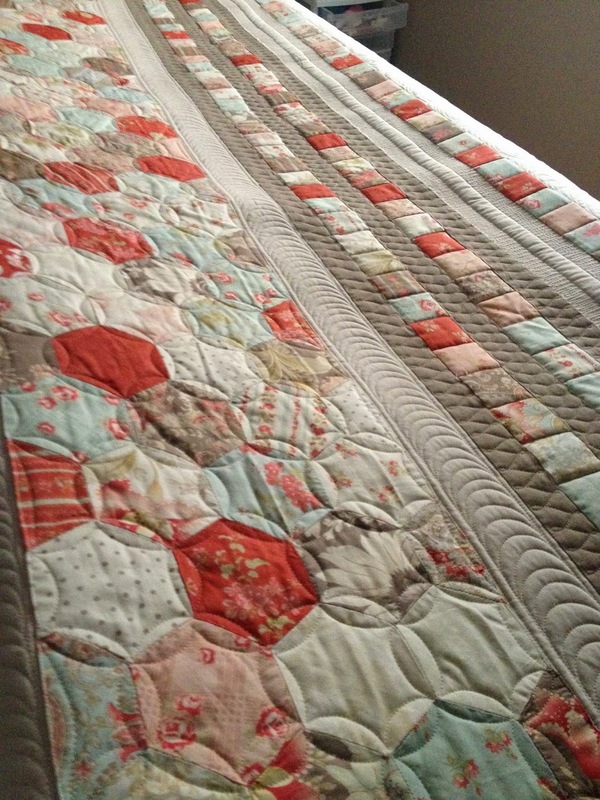 Ashley, from Yellowknife pieced this beautiful hexagon top. 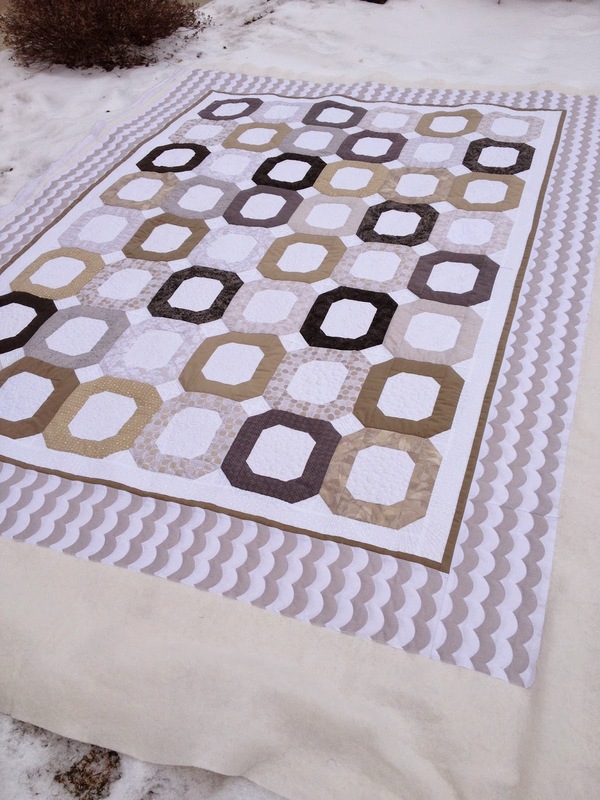 When I received it, I laid it out on my design wall and had a good thinking session. 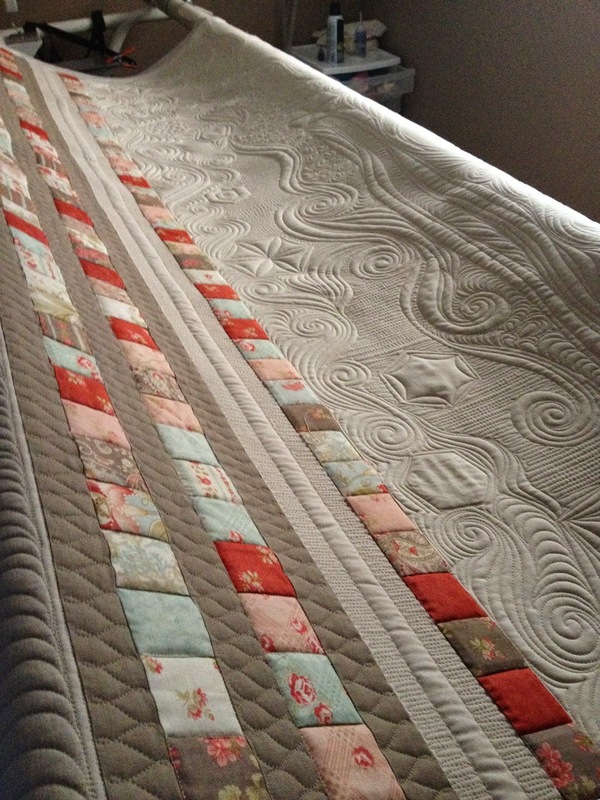 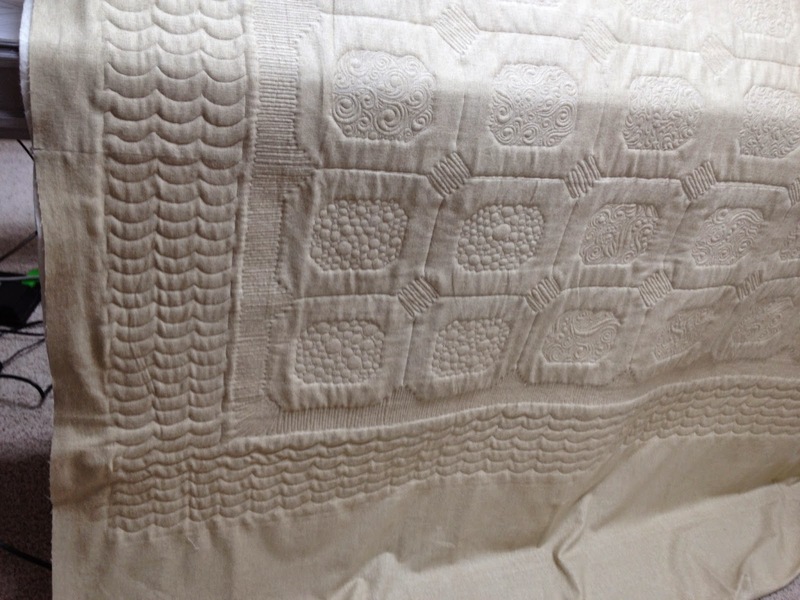 The photo below shows what a quilt looks like when I receive it - it is flimsy...a flat sheet of fabric. 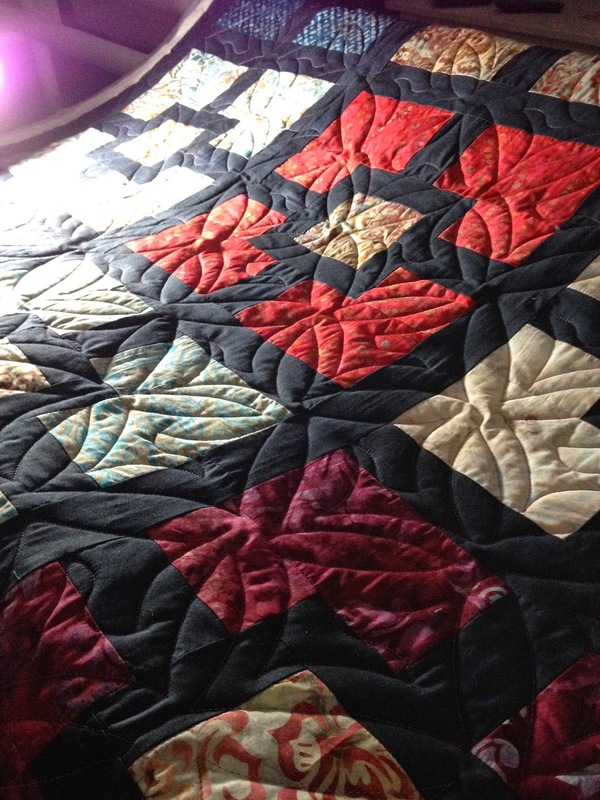 There was a lot of negative space in here...and a lot of beautiful piecing to showcase as well. 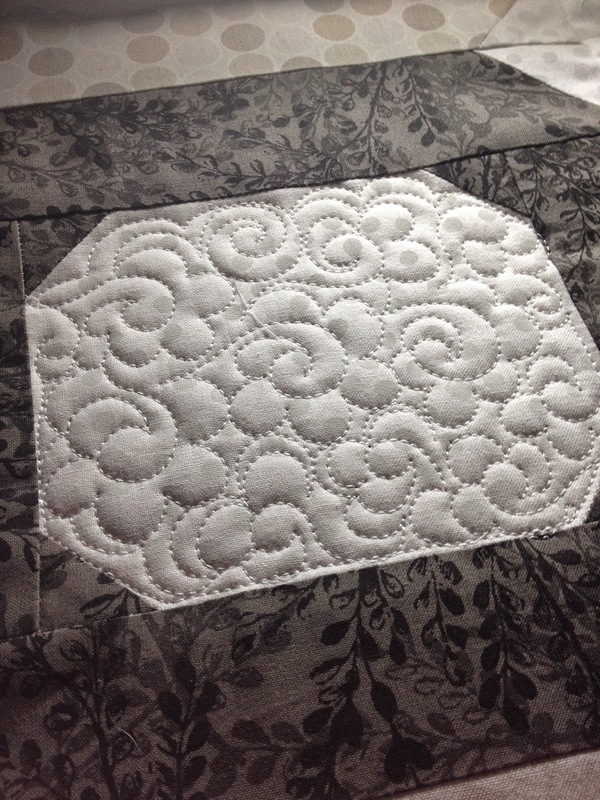 I did some ribbon candy, c's, and wishbone quilting. 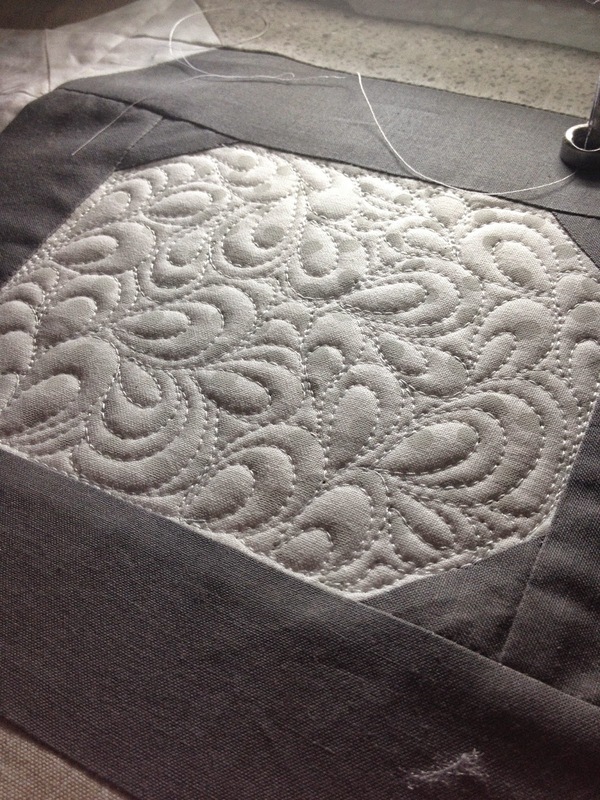 I also stitched down all the seams of the little 2''squares. 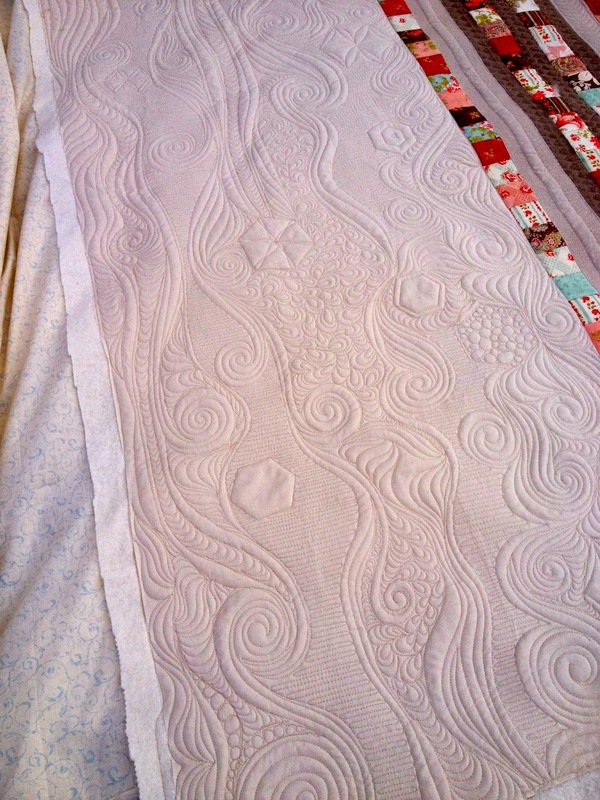 You can see what a difference it makes in texture...the right side strip has been stitched in between each square. 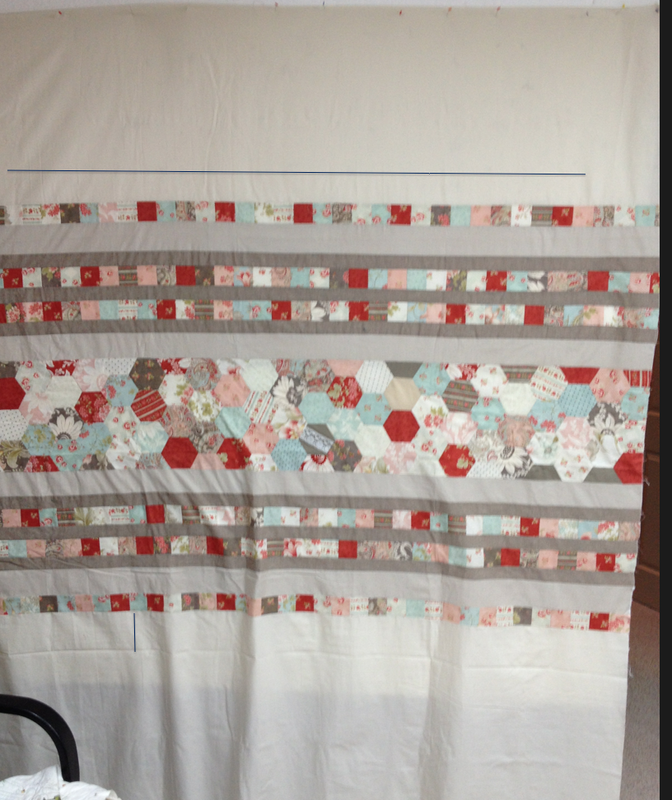 The left strip, not(this is an in progress photo) Love the extra pouf personality you get with this! 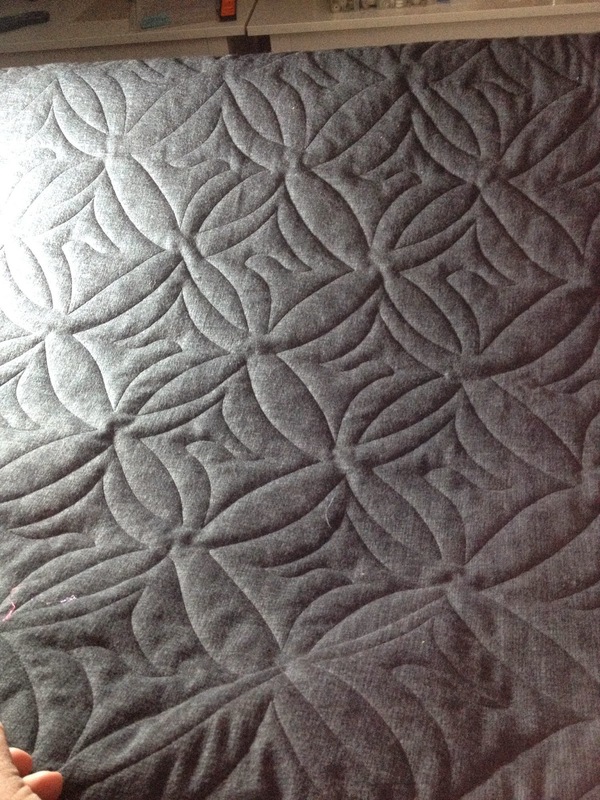 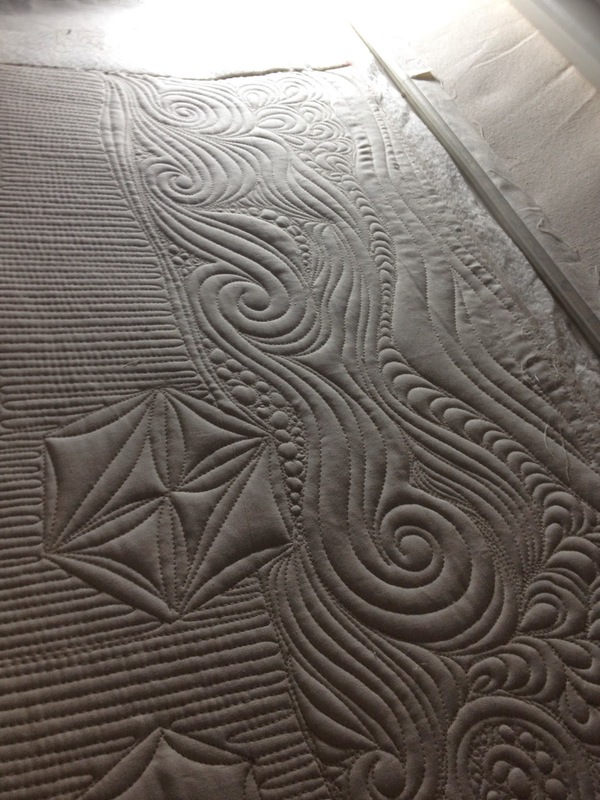 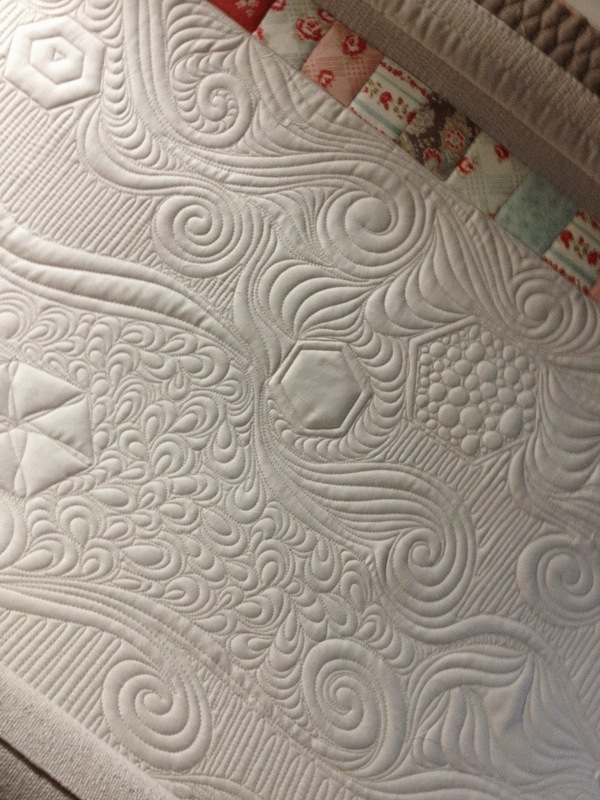 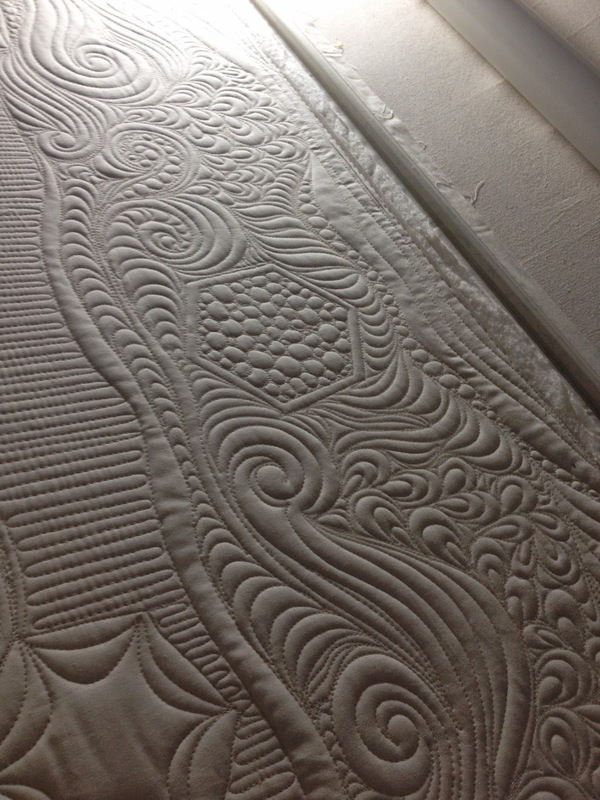 Quilted on my APQS machine. 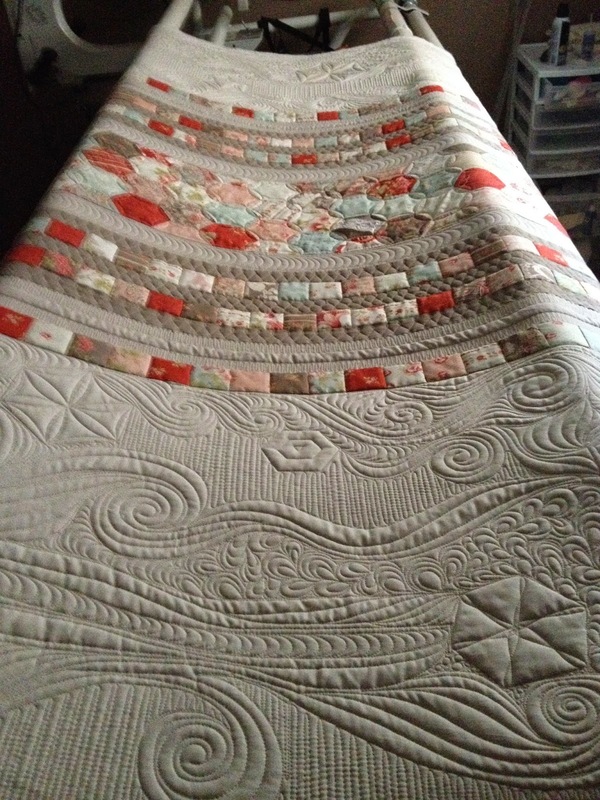 How do I tell my client I don't want to give it back? 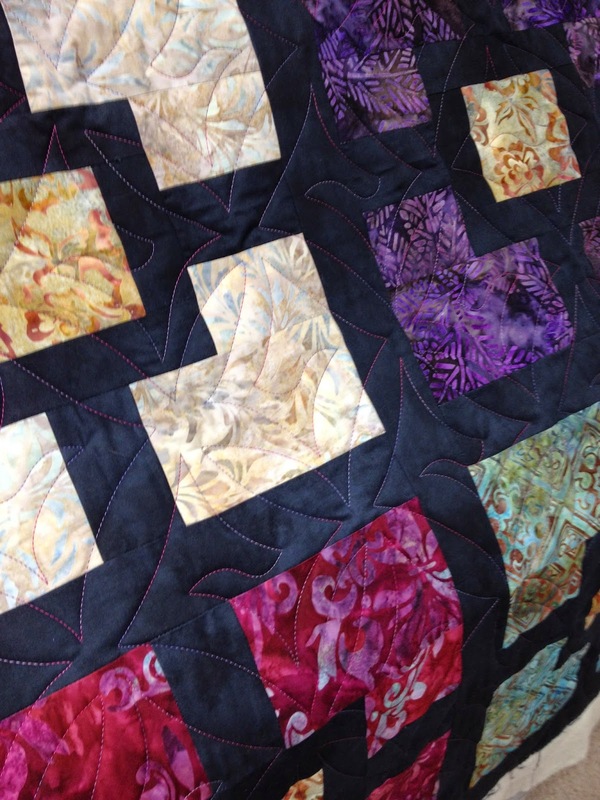 Linda brought in a few amazing quilts for me to work on this week - I love the bold batiks anchored by the black sashing on this one. 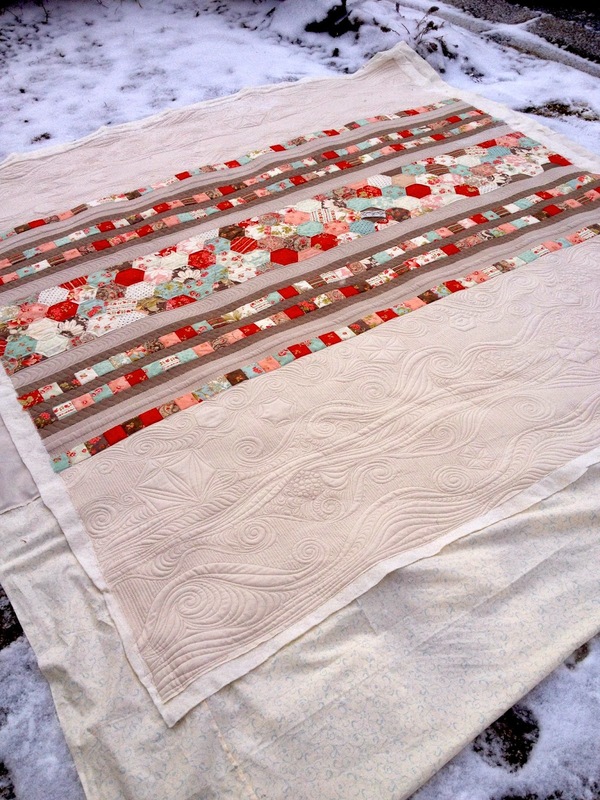 We chose a pantograph pattern called Dazzle, and a fuchsia variegated thread by Aurifil. 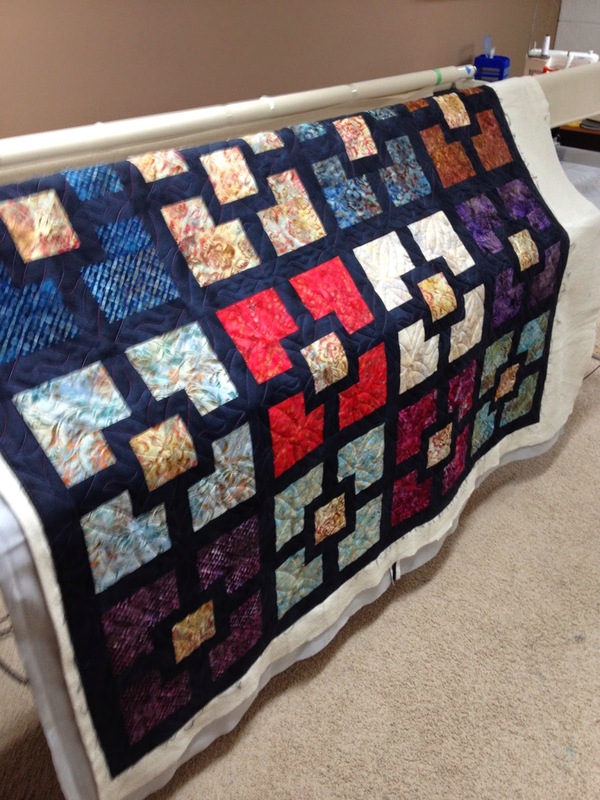 The thread colour by Aurifil just sings on this top - it melts right into the variety of colours, and then on the black sashing you see pops of the colour. 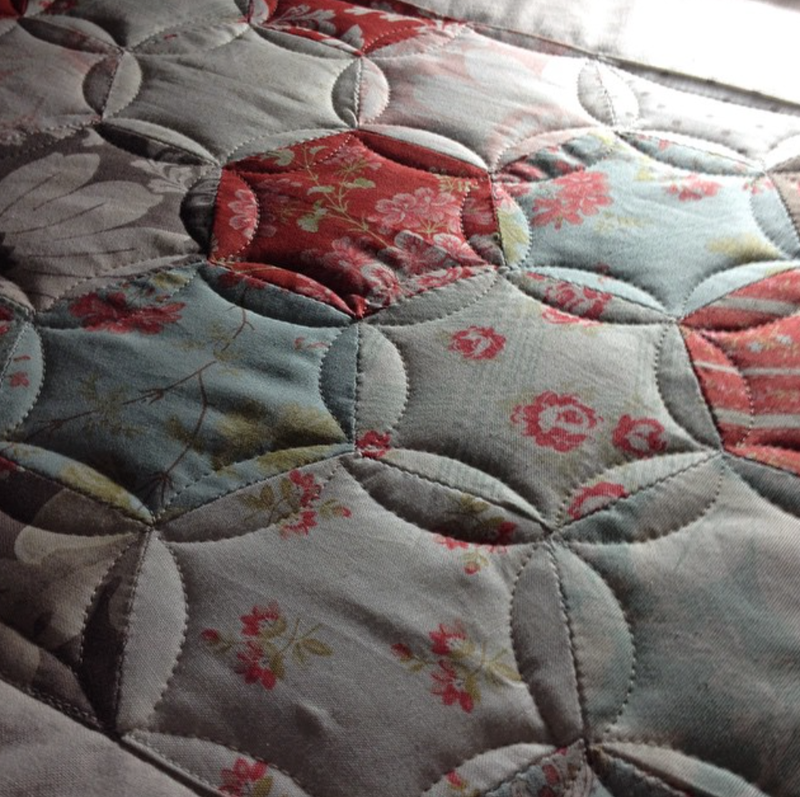 Love the colour choice! 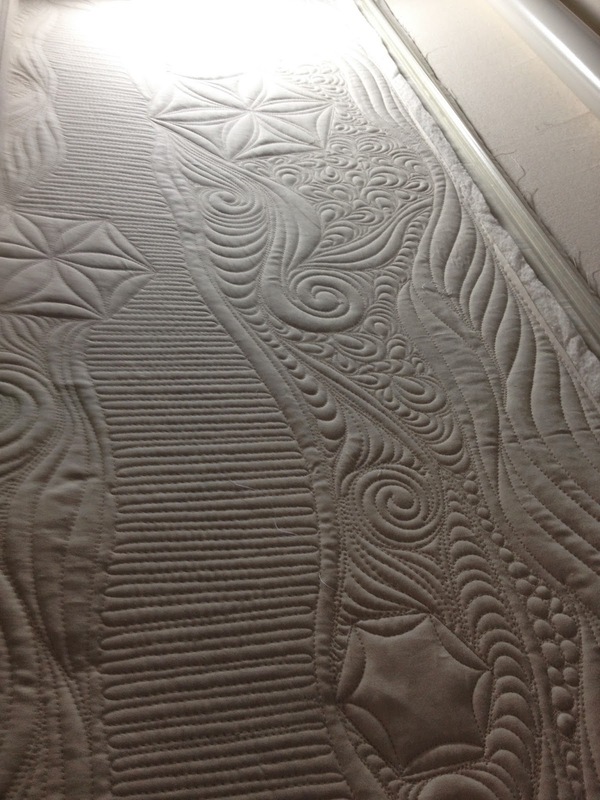 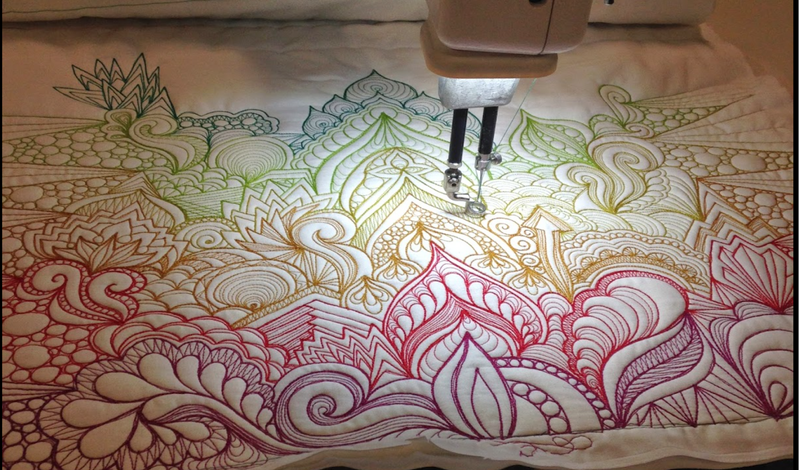 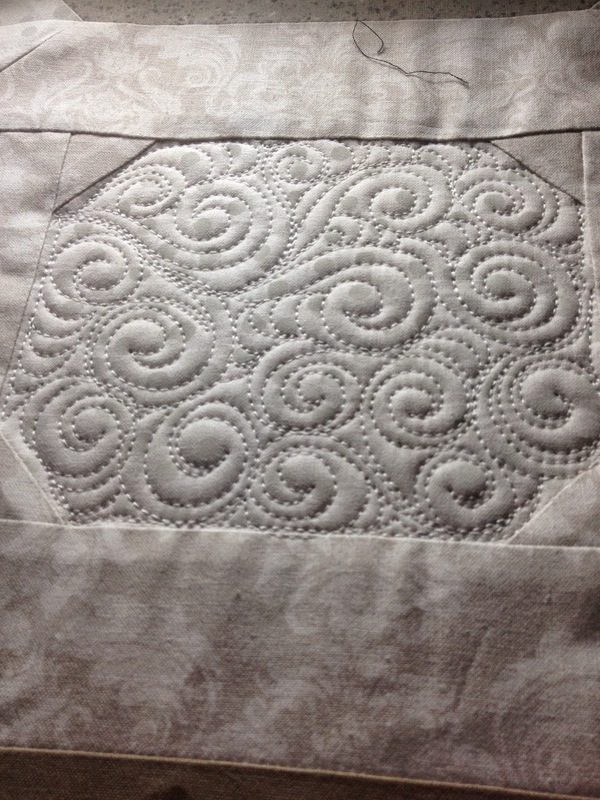 This batik beauty was quilted with a looser overall design using leafs and swirls. 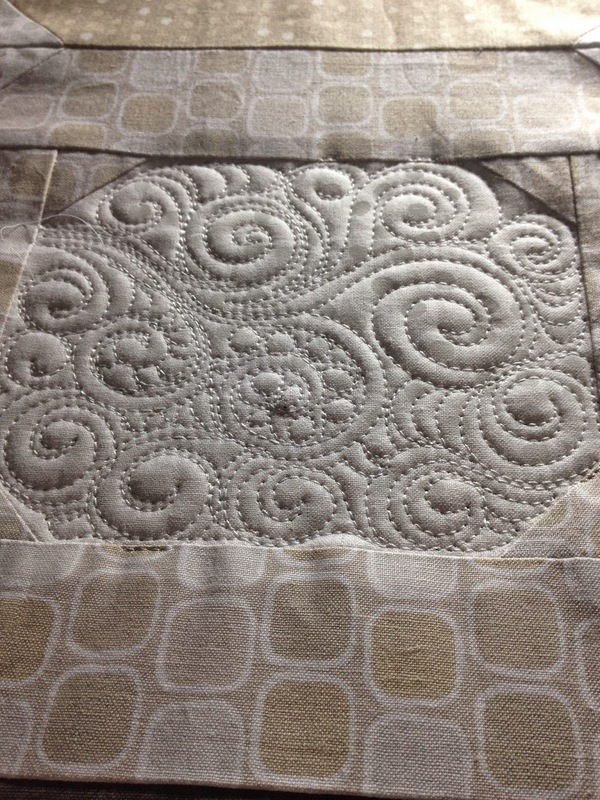 This design was fun to work on after a lot of dense quilting earlier on in the week. 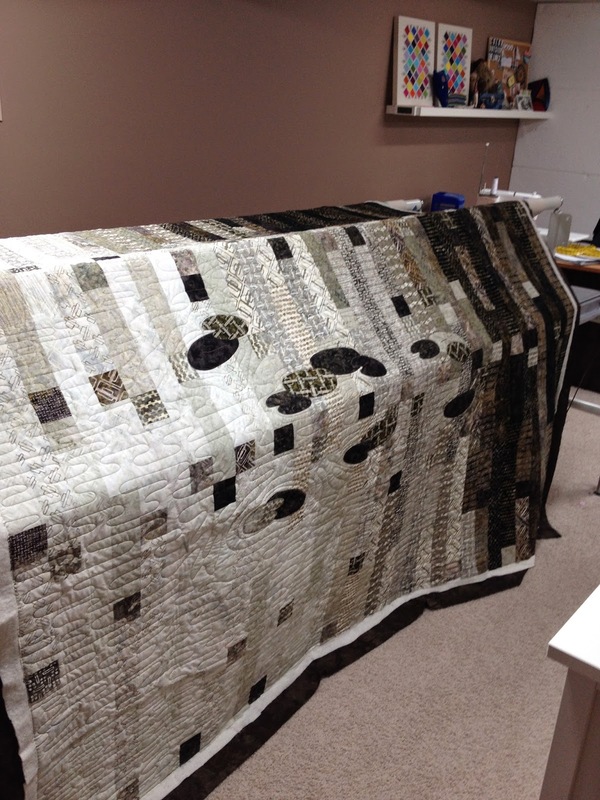 Tamara brought in this lovely batik quilt - Willow Stonehenge -The Pond pattern. 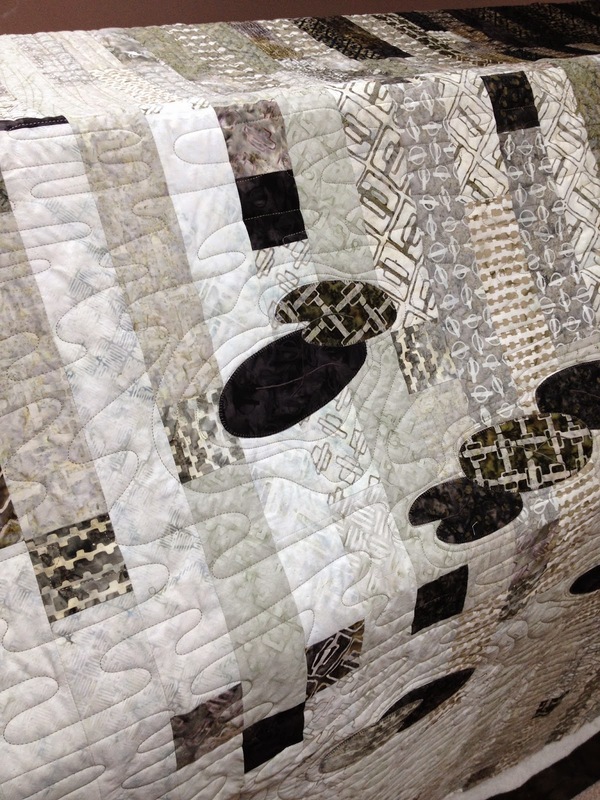 I quilted a long wavy grass texture in the darker areas, and a watery meander in and around the lily pads to represent the pond. 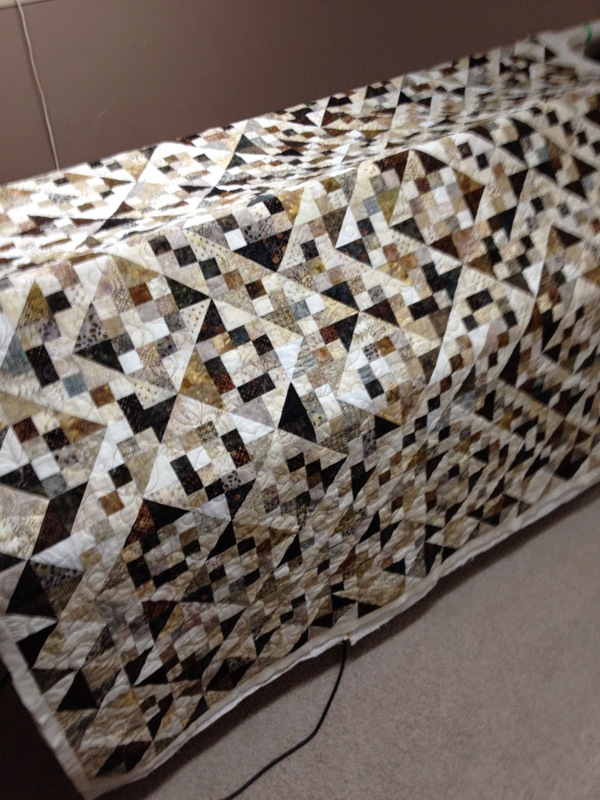 I used an incredible thread by Glide called Fool's Gold - it is kind of a metallic army green and it really goes well with those brown and taupe batiks. 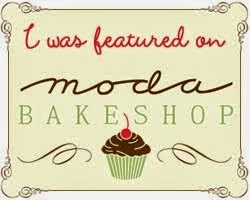 Need to order more! 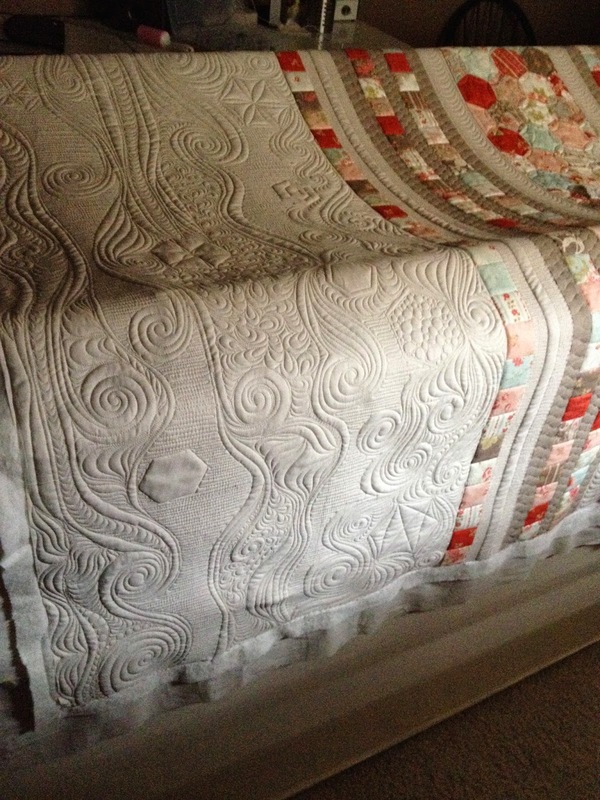 I have learned that brown quilts are almost impossible to photograph! 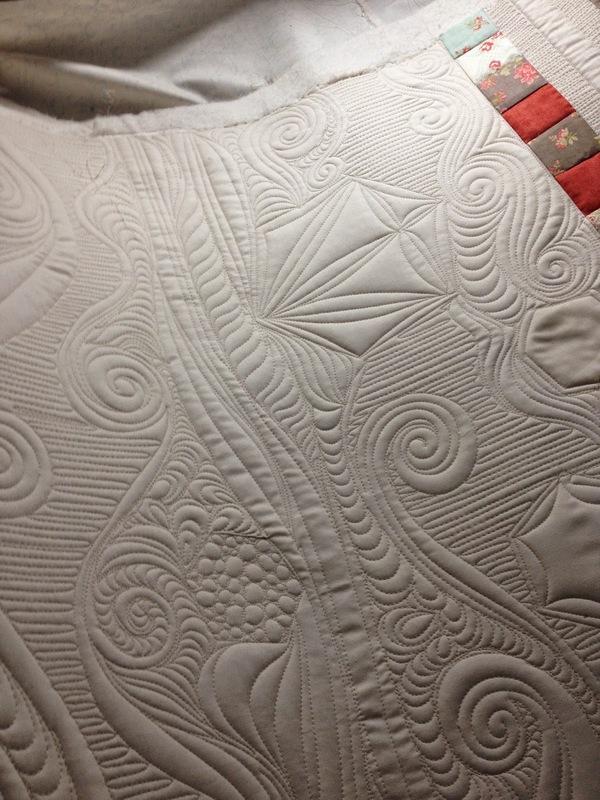 I find it really hard to get the lighting right to show the quilting!